Description: Beginning Friday, March 8th at 7:00PM and continuing every Friday during Lent in the Church referencing the book, "The Fourth Cup, Unveiling the Mystery of the Last Supper and Cross" by Scott Hahn. Description: A five week session to help participants grow in present moment awareness during Lent and throughout the year. See flyer and details in the bulletin. Description: The Living Stations of the Cross presented by our parish youth. 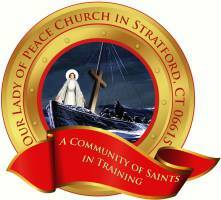 Forms available in the parish office. Contact Christine @ (203) 257-2802. Description: The Parish Center Office will close at noon in observance of Holy Thursday. Description: details will be published in the bulletin. Description: The Parish Center Office is closed in observance of Good Friday. Description: The Parish Center Office will close at noon in observance of Easter Monday. Beginning Friday, March 8th at 7:00PM and continuing every Friday during Lent in the Church referencing the book, "The Fourth Cup, Unveiling the Mystery of the Last Supper and Cross" by Scott Hahn. A five week session to help participants grow in present moment awareness during Lent and throughout the year. The Living Stations of the Cross presented by our parish youth. The Parish Center Office will close at noon in observance of Holy Thursday. details will be published in the bulletin. The Parish Center Office is closed in observance of Good Friday. The Parish Center Office will close at noon in observance of Easter Monday.